Before I dive into my mission update, I wanted to take a moment to remember Walter James Miller, who passed away on Father's Day from a heart attack. Miller was arguably one of the most important scholars in Jules Verne academia in North America, as he virtually discovered, and then raised awareness of the poor quality of English translations of Verne's work. His work on 20,000 Leagues Under the Sea was what rekindled my love for that book. If you haven't read the annotated and re-translated version Miller worked on with Frederick Paul Walter, then do yourself a favour. I briefly updated May when I posted my Full Steam Ahead! projection for the next month (feel free to check out just how inaccurate that estimation was by reading that post), but I never really said what I'd been up to, and what's been happening in the grander scheme of things. I taught my last course at the King's University College in May. It was a spring session of English 204: Introduction to the Novel and Short Story. I had six students in a compressed timeline of three weeks. It went by like a blur, but it was a very rewarding teaching experience, and a nice way to say goodbye to the institution who helped me get started in my academic teaching career. Verne's 20,000 Leagues Under the Sea was on the reading list again, and it was a pleasure to find that the positive experience students have of the text wasn't limited the fall semester of 2009. I'll be taking it with me into my English 103: Introduction to Literature course. With the end of that spring session came the end of gainful employment until July, when I start at Grant MacEwan University full time. I've been doing some MCAT prep teaching, but that's sporadic, so I've had time on my hands to get ready for fall, and attend to my own research. As regards my fall readiness, I wanted to bring two items to my readers' attention. Neither is steampunk related, but they were big finds for me, and I'm pretty excited about them for my science fiction course in the fall at the University of Alberta. The first is James and Kathryn Morrow's The SFWA European Hall of Fame anthology. It's a collection of European SF stories in translation, which is a boon to a Comparative Literature course in SF: we're expected to teach the genre in a global context, which is no easy feat. I remember my professor lamenting the lack of such works when I took the course years ago. I decided on this book over Lavie Tidhar's equally excellent Apex Book of World SF, only because the Morrow's anthology is focused more on SF, while Tidhar's anthology is a collection of speculative fiction, incorporating horror, fantasy, and SF. I will be using one entry from Tidhar: "Wizard World" by Chinese author Yang Ping, an excellent postcyberpunk story. Should be a blast. If you're in the Edmonton area and interested in taking it, the course happens Monday nights at 6:00-9:00 p.m.
Now that the agony of decision is over--"Should I include Asimov? What about Heinlein?" --I've finally been able to return my attention to steampunk. I tried reading George Mann's The Affinity Bridge in May, and gave up - I found it to be the worst sort of tired pastiche that people stereotype steampunk as. The Affinity Bridge is everything Philip Reeve complains about in his post on steampunk's stink. I had to read Frank Herbert's Dune to clear my palette before returning to steampunk reading. When I did return, I finished up Chris Wooding's wonderful Retribution Falls, which was thoroughly enjoyable. While I have yet to finish my close readings of Hunt's The Court of the Air, Campbell's Scar Night, and S.M. Peters' Whitechapel Gods, I neede to turn my attention to Lisa Smedman's The Apparition Trail, as it's my first entry for Canuck steampunk month (which starts tomorrow). While everything in July will be steampunk by Canadians, Smedman has the distinction of having the only steampunk novel set entirely in Canada, which is why she's first on the list. When I finished Apparition Trail, I moved on to Gaslight Dogs by Karin Lowachee, in further preparation for July. I received an ARC of Android Karenina, which I'll be commenting on in late August. I thought it best to have read the original to make any sort of decent commentary on the mash-up. I also received an ARC of steampunk erotica, which I'll post about whenever I stop getting delayed in reading it (I can only take it bite-sized chunks, or I'm utterly distracted for the rest of the day). To others who have sent ARCs, I'm doing my best to get to them, but I don't want to deviate too much from my themes. I'm hoping to cram Napoleon Concerto, and Wonderdark into August. Speaking of themes, I enjoyed mapping out the entire year's posts. While I'm sure it will be subject to change, it's nice to have a plan. Both plan and thematic months were inspired by Cory Gross' Voyages Extraordinaires blog. Cory and I were able to finally meet face-to-face back in May, and over Boston Pizza appetizers, I learned that the reason his posts are so erudite is because he plans his blog nearly a year in advance. A smart move, and while it's one I hadn't been able to take advantage of initially due to my insane schedule in 2009, it's one I'm using to drive this blog to mission's end. 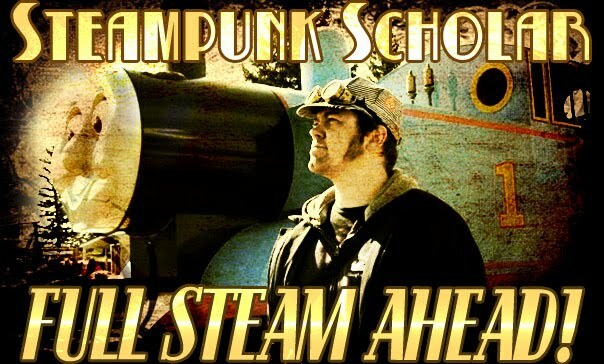 While there will be new steampunk released in the next year (and yes, I'll read as much of it as I can - ARCs are welcome! ), I can at least say I should be done the major reading of primary texts by fall of 2011, when I'll turn my attention to precedents (Verne, Wells, Burroughs, Doyle, etc. ), and then finally to secondary sources. I plan to finish before the five year mission projection, but we'll see how next summer goes. 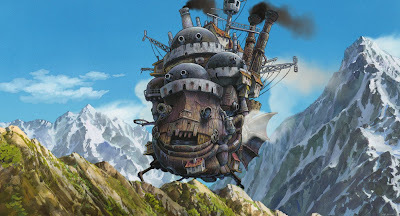 Some links to consider...Matt Delman started up Doctor Fantastique's Show of Wonders, a new "monthly e-zine focused solely on the proliferation of Steampunk materials. DIY articles, scholarship, short fiction, and whatever your Steampunk heart desires." Go check it out and submit some material! 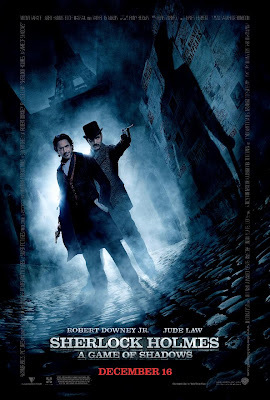 And while I don't think Nancy Overbury's Steampunk Tuesdays really needs an introduction, I'm giving one anyhow, because I think her exploration of the depth and breadth of steampunk culture is worth checking out. Thanks to Piechur for an email that linked some links and then I clicked on other links, which lead me here, to The Weirdside, where it sounds like Adam Callaway and I agree about steampunk being more of an aesthetic, and this post at Fluttering things, which also seems to be leaning in this direction. Jay Lake has been saying his forthcoming Babykillers is an attempt to play with the idea of steampunk as a skin or aesthetic, and I look forward to its October release! I've been invited back to Steamcon, and while I'm hoping to go, the issue of funding looms rather large. I was also invited back to Edmonton's home-grown Pure Speculation SF/Fantasy convention in October, where I'll be presenting on Steampunk 101, Vonnegut's "Harrison Bergeron" and the 2081 film, Joe Lansdale's Jonah Hex comics, and sitting in on a panel on horror. I'm also hoping to get to Calgary's Con-Version, but we'll see how that all pans out. I submitted "Steampunk: Technofantasy in a Neo-Victorian Retrofuture", the chapter that inspired my Steampunk as Aesthetic post. Pending edits and revisions, it will be released in Contemporary Fictional Repurposings and Theoretical Revisitings of Fairy-Tales and Fantasies later this year, from Edwin Mellen Press. My "Steam Wars" article should be coming out in the Journal of Neo-Victorian Studies very soon. I've sent off the final draft, and we're down to editing colons and citations. I've got a few ideas for articles in my head. One will be about the literary context of steampunk - where does it fit, where did it emerge from, etc. The other is going to deal with the fashion, and will likely involve a close reading of the films Moulin Rouge!, the recent Sherlock Holmes film with Robert Downey Jr., as well as references to Clockwork Coutre, Dark Garden corsets, and the Victoria's Secret fashion show. Between that last reference and the steampunk erotica, it'll be wonder if I get anything done over the summer. See you tomorrow for Canada Day! Oh, Chapters carries Haika Soru press books? Guess I need to make a trip there soon . . . They do indeed, and a good selection at that! May I suggest http://www.etsy.com/shop/Harlotsandangels for steampunk corsetry? Also, check the "fashion" section on the Steamcon website. I would absolutely love to see you there.